Located just outside the city of Edinburgh, one crosses over one of the two Forth Road bridges to reach the only kingdom in Scotland, the Kingdom of Fife. There, on top of a green hill (all hills are green in Scotland even though it's the middle of August) resides the renowned local chef, Jenny Thomson, along with her husband Kenneth and two young children. The house is an 18th-century stone manse set among the most gorgeous gardens. In front all ornamental shrubs and lawn, and to the rear, the lee side of the house, an abundant kitchen garden complete with bee hives, chickens and a small wooden house Jenny refers to as the Summer House, where they barbecue and picnic in the warm evenings. All vistas from the main house and Summer House are strikingly bucolic...rolling hills, shades of green depicting different agricultural endeavors, forests, and of course grazing sheep. The perfect setting for a romance novel, or minimally the intrigues of a roving country veterinarian. But no intrigue this day. Simply six lucky Azamara Club Cruises passengers who've signed up for the intimate Cruise Global, Meet Local tour "Scottish Manse Cuisine" this fine day in August (this tour is limited to six!) We are transported by our guide, Jack, in something between a minivan and a luxury Lexus. When we arrive we are met by Jenny and her mother Alison, who's volunteered to serve as sous chef, and ushered into Jenny's private home kitchen, which is large enough to feed the Brady Bunch. We are offered a cuppa' tea and cookies, and the two generations tell us a bit about themselves and the history of the recipes we'll be preparing today. We select the apron of our choice and get started making the same shortbread cookies we've just sampled. The cookies now in the oven we moved on to oatcakes, which were historically served as a replacement to bread or rolls due to the scarcity of wheat in their climate. During this we learned the importance of oats to Scottish cuisine. Next we made "Cullen Skink" a traditional fish soup made with milk poached smoked haddock, potato and onion, with a good dash of nutmeg. Delicious and really not hard. Lastly we each created a Scottish parfait called "Cranachan". It is made with liquor-of-our-choice soaked berries from her garden, an oat and brown sugar granola-like mixture, homemade honey, and whipped unsweetened cream. To top it all off the six of us were served our work in the family's formal dining room with lovely views of the countryside on two sides of us. The tour guide, Jack, poured us the wines he personally selected for our meal, a Sauvignon Blanc from NZ, a Chardonnay from Spain, and a dry red from France, and surprised each of us with a small bottle of Scottish whisky as a memento. After the meal Jenny walked us through the kitchen garden, we all took photos and promised to stay in touch, and all too soon it was time to leave the bit of paradise in the Kingdom of Fife. As we packed up we were presented with our shortbread cookies wrapped to bring back with us to the Azamara Journey. Here's a picture of my tea the next day while at sea! 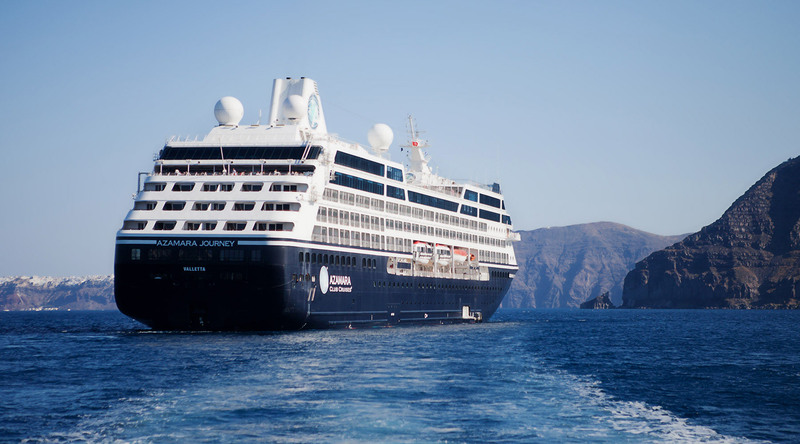 Find out more about the unique Cruise Global, Meet Local tours here. If you're interested in cruising to Edinburgh, Scotland, we have three upcoming itineraries. Pictured: Myself and five other lucky Azamara Journey guests, Jenny, and our guide Jack.